Having a kitchen banquette storage table in your kitchen does not serve as practical pieces of furniture, but also works well as a decoration for your kitchen. It can be used for having large dinners and parties or even for laying out your buffets and banquets. The storage element that comes with the banquette table adds another good usage of the furniture that allows you to store large and cumbersome objects easily. It also provides you with extra cozy seating in the kitchen, texture and creating a touch of uniqueness in your kitchen. In order to build a kitchen banquette storage table, you only need minimal tools and materials before you finish it off with paint or stain to create a variety of final look to the banquette storage table. First thing that you need to do is to arrange two 1/2-by-36-by-48-inch boards on your working area surface. Make sure the boards are paralleled to each other with their long and thin sides on your working surface. Then, you have to push the boards which are the front and rear sides of the banquette right until they are approximately two feet apart. 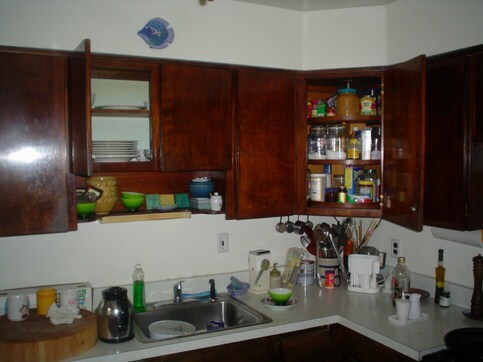 Next, you need to set a 1/2-by-36-by-24-inch board against one set of the side board ends. You must align the edges until they are even with each other. The next step is for you to make a hole into the new board, which is the side board of your banquette where the hole must be at every six inches into the front and rear boards. Then, you need to set a 2-inch wood screw into each of the hole and make sure that you tighten them completely by using a drill before you screw the boards together. After that, you need to repeat the process with another 1/2-by-36-by-24-inch board on the other end to create the other side of the board. The 1/2-by-24-by-49-inch board needs to be placed against the frame and make sure that you align the edges of your board with the edges of the frame. Next, you must drill holes at every 12 inches into the board which will be the bottom board and through to the front, rear and side boards. Then, you need to set 2-inch wood screws into each of the hole before you tighten them up in order to attach the bottom of the board. Once finished doing the above step, you need to rotate the banquette to allow the open section of the frame to face upward. You must position another 1/2-by-24-by-49-inch board on top of your banquette. Make sure to adjust the edges so that they are even with the edges of the frame. Next, you have to slide a piano hinge between the new board which is the banquette lid and the frame of your banquette. Then, you need to mark the location of your piano hinge screw holes and if the need arises for you to lift the lid you should do so. After that, you should drill a hole in each of the marked location that you have done. Then, reposition your piano hinge and screw it securely against the lid and the banquette side with /2-inch wood screws. If you do not want to cover the banquette with bead board and decided to paint or stain the banquette storage table, you must ensure that you have counter-sink all the screws completely before you cover the heads using wood filler. Your kitchen banquette storage table should be installed in its permanent location. You should be using a 4-foot level for ensuring that the top surface is always level. If it is necessary, you can use shims in order to achieve a level position. Finally, you can attach the banquette to the wall studs from the inside of the bench with 3-inch wood screws. You need to finish the banquette by staining or painting it after you have sand the item and clean the sanded dust completely. Make sure to apply the stain or paint with long and even strokes method in the same direction following the wood grain. If you decide to add a back to your banquette, you need to angle it at least with a length of 6 degrees in order to provide a more comfortable seat. This entry was posted in Home Improvement on January 28, 2012 by Mike.